The tumultuous relationship between Norman and Norma Bates has taken a turn this season. Norman’s psychosis is worsening, putting everyone around him in danger. OHSOGRAY recently participated in a press call with Freddie Highmore (Norman) and show EP Kerry Ehrin, who talked about the complexities of writing for a psychopath and just how dangerous the mother/son relationship can be. Bates Motel airs Mondays at 9/8c on A&E. Freddie, you wrote an episode this season, is this something that you want to get into more? Freddie Highmore: Yes, I’d love to. I guess it was — I mean first of all, I’m obviously incredibly grateful to Carlton and Kerry for allowing the writers room and giving me an opportunity to write an episode and be a part of Bates Motel beyond merely acting. I guess it was borne out of this desire to want to be involved in the wider process and it just seemed a little odd to me to put so much into this character for the four, five months that we shoot in Vancouver and then let it completely go and just sort of go away and ignore it for a few months. And then come back and be like, oh let’s just see what’s been happening. […] I love the writing experience on Bates Motel and being part of that team and am writing more things. Kerry, did you help guide Freddie through the writing process? Kerry Ehrin: We’ve always had a very, very, like, weirdly idiosyncratic sensibility. So that’s just been great. We’ve always sort of talked creatively, talked about writing, and this has just been a really great experience to kind of bring him into the — really the workshop of how you run a room, how you put a story together, how — just to see sort of behind the veil how that happens. Freddie, which character that was the hardest for you to write for? Kerry Ehrin: That’s a good question. It’s interesting. I think I know the answer. Freddie Highmore: What do you think the answer is? Kerry Ehrin: I won’t say. You go ahead and I’ll tell you if I’m right. Freddie Highmore: Then you’ll tell me if I’m right. […] I don’t know. I found — in terms of the writing rooms in general, I guess the hardest thing was to create the dynamic, and I didn’t have any scenes actually with Dr. Edwards in my episode. But if you know the tone of these characters that you’ve lived with for so long, and the introduction of new characters that you don’t know so well, it’s very much getting on the same page as everyone in the room without any actual sort of physical scenes to watch and to get into. I’m not sure if that’s just sort of avoiding your question, but Kerry will tell you what I struggled with more. Kerry Ehrin: Well, it was really interesting because I mean first of all, it was great to have him in the room because it was such a presence of Norman just I mean — just because Freddie has lived inside that role and experienced it in all dimensions. […] The interaction with Romero, I would have thought might be the hardest — like Romero might be the hardest character to get inside of as a writer because as an actor he’s in a place where he really does not like him. So I just thought that would be a very interesting thing from a writing point of view. I wondered how he handled that. Freddie Highmore: There is a sense of battle of control between Norman and Romero in this episode. And I guess sort of secretly inside you’re like, Norman’s just got to win all these battles, not sort of proven right. And then you have to set your sort of character’s self-interest aside and do what — and figure out what’s best for the story. How has Norman’s separation from Norma allowed him to evolve and change? 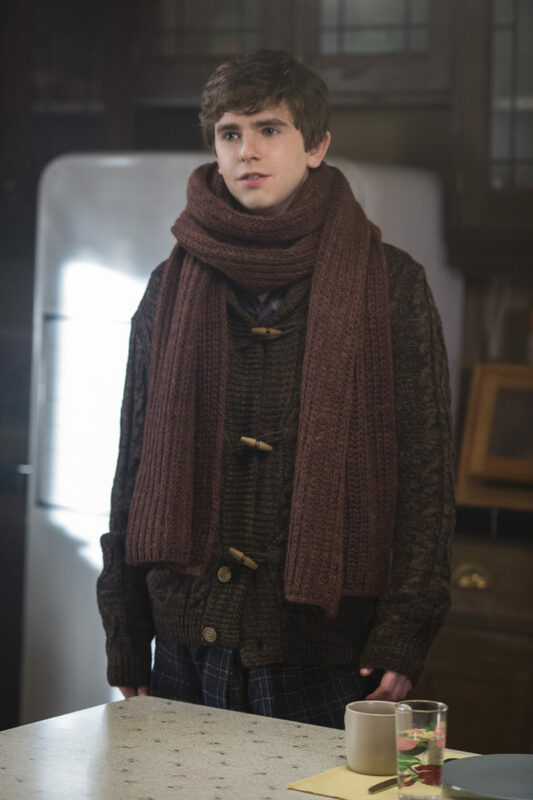 Freddie Highmore: I think part of the interesting thing about having separated Norma and Norman is that we’ve allowed the mother side to Norman to develop greater. And I think part of that is borne out of the fact that they are physically apart, and so through that sense of missing for her and yearning for her, he at times has visions of her, or more commonly starts to slip into that guise of being her. And I think that’s what was fascinating for me to play this season, those moments of transitions in scenes with Dr. Edwards, for example, where we see Norman slip into the guise of mother and take on this other side. And I feel like that is released because of their physical separation. So that’s been really, really fun to play. Would Norman have been better off staying home than going to Pine View? Freddie Highmore: Well, I feel like they have to be together. They really — there’s a scene at the end of eight when Norman says this to Norma and the whole Romero thing comes to the fore in number eight. And they do have to be together. They need to be with each other in order to function. And in a way from Norma’s point of view, I feel she slightly deludes herself by living in this dream, this very happy reality that she created with Romero. But when Norman comes home, as he eventually will, and we know from the story that he’s going to have to come back, it sort of becomes revealed as this more of a fantasy and of a dream of another life, but it’s not a life that she can ever actually leave. And so I think Norman, in number eight, in a scene towards the end, really latches onto that idea of knowing how inseparable they really are. As much as they want to deny it, or as much as they wish that it may not — might not be true, it always will be. No one will be able to get in between the two of them. No one will be able to break that cord. Is it hard to separate yourself from Norman’s introverted character now that you’ve portrayed him for so long? Freddie Highmore: Not really, no. It’s interesting the sense the sort of sense of because someone’s more introverted, it affects you more and certainly Norman is that and that’s what’s been — what’s been great I think about the writing that Kerry has lead this season is that it’s really been even more so than before focused on those nuanced interesting moments and the transitions and themes, and the keys to sort of unlocking on a deeper level various relationships. That lends itself towards a more sort of introverted take on the character. We’ve had these — for example, we’ve had these great scenes of — in episode five — between Norman and Dr. Edwards that sort of run four or five pages and it’s so bold and confident to — and trusting too, to sort of allow a scene to play out in its full as opposed to feeling the need to sort of cut the time or cut it back for television. And those moments and those long interesting themes have always been championed by Kerry. And I guess in terms of me, no, I haven’t really been that affected by — I don’t know. I kind of — you get into it on the day, of course, and it’s impossible to sort of be yourself one minute and laughing and happy with everyone, and the next you sort of change and become your character. But I feel like at the end of the day when you leave and go home there isn’t that sense of anything lingering over me. I mean in some ways, not to encourage acting as a form of therapy, but it can be quite cathartic to have a big emotional scene and in the same way when in reality you’re crying with someone or you shout at someone and you feel like you vented all of this energy. And then you feel kind of good about yourself and relaxed. [….] Maybe it’s just allowing to — maybe there is a Norman within me and I’m just allowing him to express it, to make sure it doesn’t impinge on my real life. I don’t know what I’m going to do when the show’s over. Watch out. Freddie, did being an actor help you bring a different approach to the writing? Freddie Highmore: I mean I guess you hope to do everyone justice. I mean there were certainly fun moments on set when as with every script, someone will say, oh, I’m not quite sure about this line. Like who on earth wrote this and I guess actually I’d be there on set to be like, yes, I guess okay, cut it. It’s not really my decision but don’t tell Kerry if you don’t like it. But no, and I feel like everyone appreciated me being there and the input that goes in when writing beyond the mere script. I think it was useful to and we’ve had most of the writers on set for every episode of Bates Motel this season. And I think there is something handy in being able to talk things through, and there’s such a dialogue on Bates Motel that it was never a sense of what — I don’t like this scene or I don’t like this line. It’s more about what are you trying to get into, in this moment, and working through those, and solving those little issues. And from a writing perspective, I guess you have a little bit more insight because you know the background to everything is so much better having discussed it in the room. Freddie, do you think that Norman truly is scared as he admitted to Dr. Edwards? Or is that part of his mask to the rest of the world? Freddie Highmore: It’s a really interesting question because I remember discussing this with Kerry beforehand and Nestor, who obviously directed the scene on the day. And to me, I think it ultimately is a mixture of both. I think that he exploits genuine fears that he has and real emotions that he does feel, instead of sort of entirely making them up. But perhaps he puts on a little bit of a show in exaggerating them in the moment. I think that usually when you’re upset about things, you try hard to cover it up. You — I always use this phrase of playing against the emotion and I feel like in that moment, Norman perhaps isn’t entirely genuine in that he doesn’t try and sort of behave in the way that usual people would, and sort of hide and cover that emotion up. And I feel in doing so, maybe there is a slight sense of manipulation because he’s very open and certain wants Dr. Edwards to feel it. And of course, he has his agenda. His agenda in that scene is to make sure that whatever happens, he’s going to get out of the institution and that’s his driving goal, and that can’t help but effect these genuine feelings that he’s feeling, but that perhaps he uses for his own self-interest. Kerry Ehrin: One of the really fun things about — if I could add, about writing the show — is that so often in this show, characters are not saying out loud what they’re actually feeling. They’re saying something else and it’s very layered. And it’s like there’s a whole other emotional dialogue that goes on under each scene as opposed to just what they’re saying. And I think it’s one of the things that makes — also it’s just like the acting is just so layered and amazing, but those scenes are just really fun to write. And also, this idea that you — that you cannot be both honest and manipulative at the same time I think is funny, because you absolutely can be. And I mean, my personal feeling in that scene was that he was being — there was a part of him that was scared to go home and that knew he was kind of screwed. But he had to go home and he was — he had established this trust with Dr. Edwards. And there was just so many different things going on in that scene, I think that’s — and Freddie and Damon Gupton just did it beautifully. Freddie Highmore: I think in terms of what the writing gave was to set — Norman feels — I mean he’s talking with different people but he feels very similarly about his situation when he’s talking to Norma and when he’s talking to Dr. Edwards in two of the — sort of his biggest scenes that come up towards the end of seven when he’s trying to get home. And so despite the fact that he goes into that with a similar — in a similar emotional position and with a similar desire, it’s interesting to see the ways in which he plays those two scenes differently. So to get the effect that he wants. They’re not the same scene. Kerry Ehrin: Yes, even though the content is somewhat similar, yes. Freddie Highmore: And so that’s a sort of guide to how that works and to how he manipulates and is sort of socially aware enough to slightly change his story depending on the situation itself. How does season 4 compare with the earlier seasons, generally? Freddie Highmore: I can start. I feel like the knowing now that we have a five season arc to the show and that this season that’s currently airing and the next one will be the last I think allows us to — has allowed the writers and Kerry and Carlton to pushed forward towards an end point with more haste and determination than ever before. There’s not this sense of needing to hold back anything for any longer because now is the time to reap the rewards of the payoff that — the set up that we had over the entirety of three seasons. And so the payoff is what starts to be developed in this fourth season and continues into — will continue into the fifth season. And that’s the most exciting point of the show. Because you — if you sort of started the show at the start of episode eight, or nine, or ten, or 15, it wouldn’t quite work. There’d be something odd and there would be something not unbelievable but it would be very difficult to get inside those characters. But what’s great is that we have that huge amount of back-story that we know and that we are invested in, and that this is the opportunity, in a way, for Norman coming home. There’s a sense of an attempt of a fresh start, and of resetting things and moving towards that end point.